Have you ever seen someone with thick, arched eyebrows and wondered if you could pull off that same shape? Just as we come in all shapes and sizes, so do eyebrows! However, not every eyebrow shape will suit your face. Pull your hair back and examine your features closely; then, follow the guideline below to determine what face shape you have and how to achieve the most appropriate eyebrow shape to complement your face. If your cheekbones are defined and your forehead is wider than your narrow chin, many eyebrow shapes will complement your face shape. A slight arch in your brow is the perfect compromise. Either a thick or thin brow will work, though a thicker brow is more natural-looking. If your face is similar to an oval shape, except your chin tapers to a prominent point, you may want to try a less arched or angled brow. Adding some roundness to your shape will soften the prominent angles in your face. A thicker brow balances your defined chin more than a thinner brow would. If your forehead, cheekbones and jawline are all the same width, with your jawline being quite defined, then you may want to try either a slightly angled brow to balance your face shape, or even a rounder eyebrow shape to soften the defined angles. Opting for a thicker brow also softens your heavier jawline. If you have a round face, that is, your face is as wide as it is long and widest at your cheeks, you might want to opt for a high arched brow to create the illusion of a longer face. Either a thicker or thinner eyebrow would work, though a thicker eyebrow is more prominent, balancing your rounded face shape more effectively. If your cheekbones, forehead and jawline are all the same width and your face is elongated, you may want to try a flattened brow shape, as that horizontal trace will soften the length of your face. Either a thicker or thinner eyebrow will work, though a thicker, flattened brow is more natural-looking. 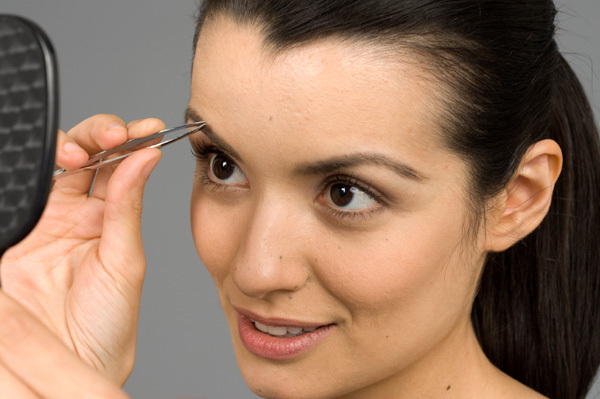 Once you’ve accomplished your perfect brow shape (you may want to get your eyebrows shaped at a salon), be sure to maintain your shape at home by only tweezing stray hairs.